We suspect that a guitar wireless system might be something that you’ve always thought about getting, but never quite got round to buying. The benefits are obvious - no more electric guitar leads to break or get in the way, and the freedom to prowl the length and breadth of the stage when you’re gigging - but perhaps you worry that a guitar wireless system will be expensive, difficult to set up and unreliable. Fortunately, none of the above is true. The cheapest guitar wireless systems are... well, cheap, and setup is usually dead simple. In some cases, you really do just plug in, turn on and play. What’s more, clever management of frequencies by the hardware should ensure that you always get a rock-solid signal, and audio quality shouldn’t suffer, either. A guitar wireless system comprises two main parts: a transmitter and a receiver. The transmitter is the bit that actually plugs into the 1/4-inch jack output on your guitar. In some cases, the transmitter is actually attached to the plug, so you have the guitar equivalent of a USB dongle; in others, the transmitter comes as a bodypack that can clip to your belt or slip into your pocket. This is then connected to the 1/4-inch output on your guitar using a proprietary cable that comes in the box. Your guitar’s output can then be transmitted to the receiver. Some products feature this in a pedal format that can be slotted onto your ‘board, while others have it as completely standalone unit that can sit on your amp or in another appropriate place. The receiver has an audio output that can be plugged into your amp or anywhere else you might want to send it. The transmitter in your guitar wireless system will run on battery power. It might have a built-in battery that can be recharged, or take standard batteries that can be changed as required. Either way, if you go into a gig fully charged you shouldn’t need to worry about running out of juice halfway through; today’s guitar wireless systems can run for many hours at a time, so you can be confident that you can play as many encores as you like. The Relay G10S wireless system is designed for integration with pedalboards, thanks to a rugged metal stompbox receiver and 9V power supply operation. Intelligent setup features mean the unit should locate and lock onto the strongest available wireless frequency as soon as the transmitter is docked in the receiver. The system provides 24-bit audio quality with up to 130-foot line-of-sight-range. Around the rear of the receiver is a control to simulate cable capacitance, plus XLR and 1/4-inch outputs and a USB connection. The included G10T receiver features a rechargeable battery that delivers eight hours of play time on a single charge, so even if you're playing a marathon set, it should have you covered. Another pedalboard-based system, the WL-50 promises plug 'n' play operation and features a receiver that sits on your pedalboard. Wireless connection is set automatically, and we're promised low-latency, rock-solid performance and a decent operating range. There are also selectable cable tone simulation options: short, long and bypass. The transmitter can be used for up to 12 hours at a time and slots neatly into the receiver's docking port when you need to charge its battery. The receiver can run on two AA batteries or get its juice from the optional PSA-A adapter. 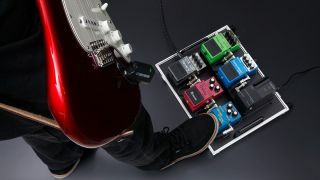 Choose the latter option and its DC output can distribute power to one or more other pedals using an optional daisy-chain cable, which could be useful. It's got nothing to do with Bono et al, but the U2 could still be the guitar wireless system you've been looking for. Operation is simple: plug the transmitter into your guitar, the receiver into an effects pedal or amp, then turn them on. Once the two are talking to each other, you're good to go. The setup process is simple, then, and you're also promised high-quality audio performance, great tone and reliability. The U2 might be made out of plastic, but it promises to be pretty durable. The five-hour running time isn't as much as on some of the other systems, but that should still be more than enough to keep you roaming the stage for an entire gig. The Classic is a light and easily portable system. The transmitter is powered from a nine-volt supply and is very compact. Sporting LEDs that indicate signal and charge levels, it will sit unobtrusively on your amp or pedalboard, although you'll need to be mindful not to stamp on the two small antennae in the latter configuration. The transmitter, not much bigger than a PP3 battery, has an integral jack plug (with over 270 degrees rotation) and will happily plug into the output socket of most guitars, even Strats. Our only concern really is a flimsy battery cover. With a decent range for stage use, the Classic gives a solid signal at all times - it automatically changes channels to avoid interference, transmitting on four channels while testing four more for backup. There are no tonal deficiencies, and we like the nice clear top-end, which, if desired, can be toned down by switchable simulation of 10-, 20- and 30-foot cables. This is one dog that will give you a new wireless performance trick. The XSW 1-Cl1 has the look of a more traditional wireless system, comprising a bodypack transmitter and desktop receiver unit. You can play for up to 10 hours, while automatic frequency management and sync via remote channel should make for easy setup. If you're playing in a large band, rest assured that you can use up to 10 of these systems simultaneously. Obviously, if you're looking for a receiver that sits on your pedalboard and a transmitter that plugs straight into your guitar then this isn't the product for you (a cable is supplied to connect your guitar to the transmitter, incidentally) but Sennheiser has been doing the wireless thing for many years now, so if you do plump for the XSW 1-Cl1, you can be sure that you're going with a brand that has a strong reputation in this area. Like Sennheiser and Shure, AKG is best-known for its microphones, but it offers this wireless system for instrumentalists, too. Like many of the products on this list, the WMS40 Mini promises plug-n-play operation, and you can play for an impressive 30 hours using a single AA battery. The fact that this can quickly be replaced - there's no need to wait for an internal battery to recharge - could count in its favour. Clear sound quality is also high on the agenda. It works as you'd expect, with the transmitter - which can be put in your pocket or clipped to a belt - connecting to your guitar via a supplied cable, and the desktop receiver outputting audio via a 1/4-inch jack. If you shop around, you'll find that the AKG WMS40 Mini sits at the cheaper end of the price spectrum, making it worth considering if you want a budget guitar wireless system. A three-part package, this guitar and bass-friendly bundle includes the GLXD6 receiver, which sits on your pedalboard and has the added bonus of a built-in tuner, the GLXD1 bodypack and the WA305 cable, which is used to connect the bodypack to your guitar. There's automatic frequency management that's designed to deliver a reliable, rock-solid signal, while exceptional audio quality is also promised. You're looking at up to 16 hours of continuous use before the transmitter's built-in batteries need to be recharged, and the transmitter itself is made of metal for extra durability. This is a comprehensive package, then, albeit one that costs more than some of the competition.